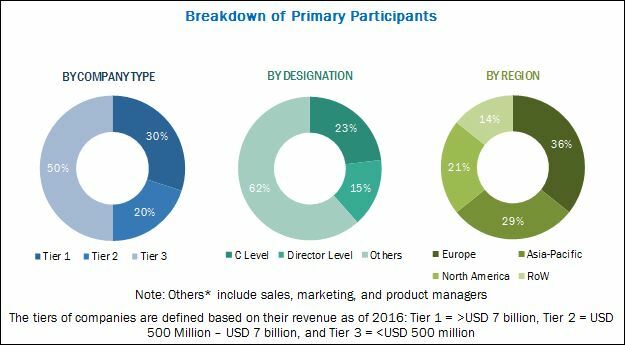 [191 Pages Report] The Extruded Plastics Market is projected to grow from USD 184.34 Billion in 2016 to USD 291.74 Billion by 2026, at a CAGR of 4.7% from 2016 to 2026. The base year considered for company profiles is 2015; where the information was not available for the base year, the prior year was taken into consideration. Secondary sources such as company websites, directories, and database such as Hoovers, Bloomberg, Chemical Weekly, Factiva, ICIS, and other government and private websites have been used to identify and collect information that is useful for this extensive commercial study of the extruded plastics market. Primary sources, which include experts from related industries, have been interviewed to verify and collect critical information as well as to assess the prospects of the market. The top-down approach has been implemented to validate the market size. With data triangulation procedure and validation of data through primaries, exact values of the overall parent market size and individual market sizes have been determined and confirmed in this study. The breakdown of primaries conducted is shown in the figure below. The ecosystem of the extruded plastics market consists of suppliers of key resin types such as low density polyethylene, polypropylene, polyvinyl chloride, high density polyethylene, and polystyrene, among others. Several companies such as The Dow Chemical Company (U.S.), SABIC (Saudi Arabia), and Dupont (U.S.) are involved in the production of feedstock materials. The demand side users include companies from packaging, building & construction, automotive, consumer goods, electrical & electronics, and other industries, which use plastic extrudates for various applications such as packaging and insulation, among others. The extruded plastics market is projected to grow from USD 184.34 Billion in 2016 to USD 291.74 Billion by 2026, at a CAGR of 4.7% between 2016 and 2026. The growing demand for extrudates from the construction industry is expected to drive the extruded plastics market. 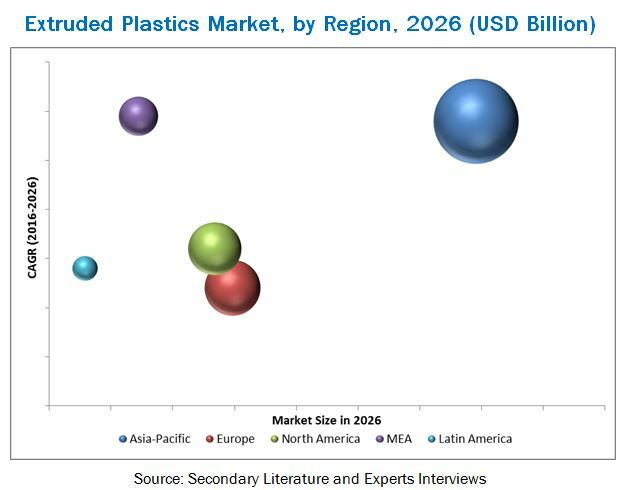 Increasing demand from Asia-Pacific region from end-use industries such as packaging is also expected to fuel the demand for extruded plastics. The extruded plastics market has been segmented on the basis of type, end user, and region. Based on type, the low density polyethylene segment dominated the extruded plastics market in 2015, owing to its increased demand for flexible food packaging as it a food grade material. Based on end user, the packaging segment dominated the extruded plastics market in 2015, due to rise in demand for packaging from food & beverage and consumer goods, especially for storage and protection of products during logistics. Cost efficiency with complex-shaped products and excellent mechanical properties is driving the demand for extruded plastics. The Asia-Pacific region dominated the extruded plastics market in 2015. This market in Asia-Pacific is expected to grow at the highest rate during the forecast period, owing to increasing demand for extruded plastics from countries such as Japan, China, India, and Indonesia, among others. Improving economy of scale, and increasing manufacturing & construction activities in the region with growing investment in R&D and plastic production from key players is driving the Asia-Pacific extruded plastics market. Emergence of domestic manufacturers in the region has led to an increase in import of raw materials of extruded plastics. The extruded plastics market lack product differentiation, owing to similar chemical & mechanical properties in raw material and extrudates, which create intense competition among their manufacturers. Eventually, inter-material and inter-polymer competition cause a major challenge to the growth of the extruded plastics market. In addition, there are various plastic processing methods such as injection molding, which pose a challenge to the growth of the extruded plastics market. The DOW Chemical Company (U.S.), Sigma Plastics Group (U.S.), ExxonMobil Chemical Company (U.S.), Bemis Company Inc. (U.S.), SABIC (Saudi Arabia), Chevron Phillips Chemical Company LLC (U.S.), JM Eagle (U.S.), Berry Plastics Corporation (U.S.), Saint-Gobain S.A. (France), E.I. Dupont De Nemours and Company (U.S.), and Sealed Air Corporation (U.S.) are the major players in the extruded plastics market. These players have been focusing on developmental strategies of mergers & acquisitions, expansions, and new product launches that have helped them to expand their businesses in newer geographies.